For Immediate Release – July 28, 2018 – Kreuth – It was truly a special show for Gina Schumacher in Kreuth, Germany, where the National Reining Horse Association (NRHA) European Derby and European Affiliate Championship were being held. The past NRHA Non Pro World Champion clinched the 2018 NRHA Level 4 Non Pro European Derby title on Friday riding Snip O Lution (Einsteins Revolution x Snip O Chex) owned by CS Ranch Management SA. During the last day of competition, the pair went on to take the $5,700-added NRHA European Affiliate Non Pro Reserve Championship with a 216. The cherry on the cake for Schumacher was the top step of the podium with her Non Pro World title companion, Gotta Nifty Gun. Riding the 8-year-old stallion by Dun It Gotta Gun out of Custom Nifty Nic, also owned by CS Ranch Management SA, the German rider rode to a 218 and the top step of the podium. Schumacher also took first and second place with her two horses in the $1,800-added NRHA Non Pro ancillary class. Sharing third place honors with a 215 was French Marie Baralon riding Chicken Sandwich and Tina Kuenstner-Mantl with Nu Chexomatic between the reins. With Baralon in the saddle, Chicken Sandwich, a 10-year-old mare by Ricochet Rooster out of MS Sanditch Whiz, rode to many NRHA and FEI titles in Europe. Kuenstner’s past NRHA Open World Champion Nu Chexomatic, an 11-year-old gelding by NRHA Million Dollar Sire Nu Chex To Cash out of Tejons Texi Lena, owned by Jacpoint Quarter Horses, boasts over $173,600 NRHA Lifetime Earnings (LTE). 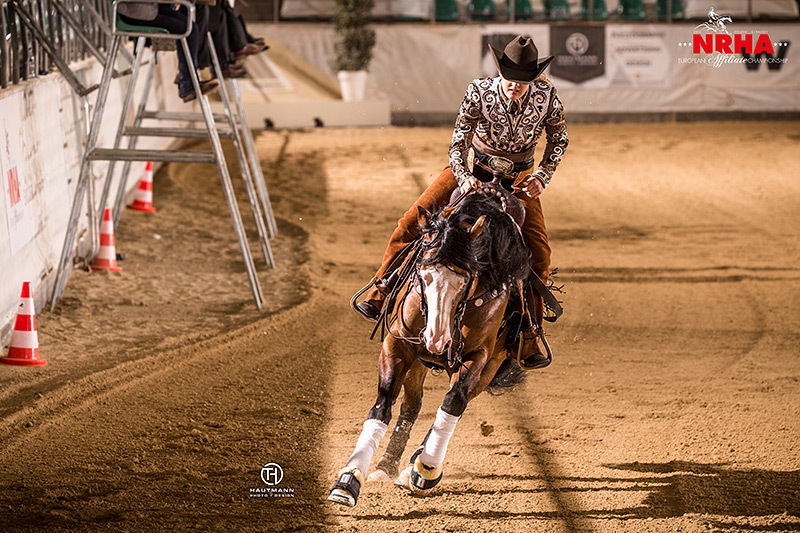 Following the last class offered in the 2018 NRHA European Affiliate Championship, counting 19 participating nations, the final Nation Standings were determined: Austria took the lead with 404 points followed by Belgium (389.5) and Great Britain (343). The Austrian Reining Horse Association received $500 for topping the rankings.